Nick Carlton won at the Willows on Decoy Lakes. Fenland Rods angler Mac Campbell continued his successful season, this time on the Snake Lake at Headfen Fishery. Drawing peg 5 he fished the pole close in tight to the bank with luncheon meat and maggots to claim a winning weightof 97lb 5oz. Dave Williams won a Tydd Gote match. Runner-up was Dave Garner who struggled in the first half of the match, but his swim came good in the end weighing in 82lb. Third place went to Tony Nisbett on 81lb 9oz. In-form Dave Williams added another win to his list of impressive results. He topped the Wednesday Tydd Gote match on the North Level Drain with a mixed bag of small fish taken on the pole with pinkie over groundbait for 8lb 12oz. Andrew Kilby took the honours in the Sunday club match with 10lb 12oz, Pete Emery was second on 10lb 6oz. Packington Fishery on Sunday, the JVAC anglers had a little extra room around the Willows at Decoy Lakes. That usually makes for really big weights, but unfortunately the strong wind made it really tough going for most of the competitors. Yet match winner Nick Carlton (right) made light work of it and topped the field from unfancied peg 22 with a net of barbel taken close in on the pole for 113lb 4oz, all caught on a worm and caster approach. In second place was the ever-consistent Chris Saunders. He fished cat meat from peg 34 for 108lb. In third came Steve Smith with 97lb 12oz taken from peg 25 fishing a short pole line. The latest match was fished on the high bank pegs on Gunwade Lake, Ferry Meadows. Kev Wadge took the honours at the Magpie Pool. A simple pellet shallow attack and pallet and dead maggots in the margins saw him weigh in with 116lb 16oz ahead of Graham Welton (111lb 12oz) and Kevin Shillie (103lb 12oz). In the Rookery Waters Qualifying Open, Steve Pell made the most of his good draw, booking his place in the August two-day final with a match-winning 132lb 10oz from peg 18. He fished 4mm and 6mm cubed meat tight over to the far bank in 12 inches of water. 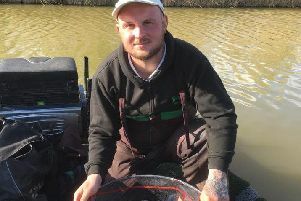 Runner-up was Richard Bond fishing the Method feeder tight over with meat from peg 45 to weigh in 121lb 6oz. Graham Welton (63lb 14oz) was third. No big bream weights were recorded, but some nice mixed bags were taken on the long pole. Out in front was a delighted Fred Tame who won his first match with the club with 15lb of mainly skimmers caught on sweetcorn. Haddon Lodge: 1 Lucio Melillo senior 32lb 14oz, 2 Martin Harwood 23lb 6oz, 3 Martin Quelch 20lb 7oz. Ramsey AS (Middle Level): 1 Paul Kilby 3lb 10.5 oz, 2 Ray Myring 1lb 3oz, 3 Keith Rayment 11oz. (Six Island Pool): 1 Keith Rayment 96lb 4oz, 2 Vince Hull 85lb 4oz, 3 George Coles 85lb 4oz. Over 60s (Float Farm Fishery) 1 Danny Carlton 164lb 4ozs, 2 Dave Schwinger 140lb 6oz, 3 Ted Rowe 115lb. (Open) 1 Andy Adams 101lb 10oz, 2 Tony McGregor 95lb 3oz, 3 Mike Linnell. Tuesday Club (Gunwade Lake): 1 Fred Tame 15lb, 2 Mike Smith 11lb 8oz, 3 Mike Mohan 10lb 12oz.